Wheels, baby, wheels. And maybe some big sturdy hooves. Exploring by bicycle, motorcycle, and horseback is an immersive adventure in Rockbridge County. Smooth byways and leafy trails climb the Blue Ridge Mountains, roll beside the Maury River, and loop through miles and miles of barn-studded countryside. When it comes to road biking, the secret is out: Rockbridge County is a prime place to pedal. Beautiful mountain scenery is the big draw, but low-traffic roads and bike friendly citizens spin Rockbridge County into the cycling big leagues. Quaint downtowns, bustling with farm-to-table bistros and locally owned shops, break-up the longest rides. The heart-pumping loop between Lexington and Goshen Pass churns over North Mountain then rolls past rapids and redbuds on Route 39. Feel the breeze, gaze at the greenery, cool off in a creek and smell the fresh-cut grass on this fifty-mile favorite. Not up for climbing mountains? Then take your pick of creeks, hills and villages on several scenic loops connecting Lexington, Staunton, and Natural Bridge. The quickest route between the three communities is Route 11. Once known as the Great Valley Road, this lush thoroughfare carried German and Scots-Irish settlers through the Shenandoah Valley in the 1700s. Today, roadside distractions include Hull's Drive-In, Devils Backbone Brewery, the Virginia Safari Park and the limestone arch at Natural Bridge. The Blue Ridge Parkway threads a smooth but challenging course through the Blue Ridge Mountains. Overlooks and trail heads are common sites and deer sightings are almost guaranteed. The TransAmerica Trail, established in 1976 to celebrate the Bicentennial, swoops across the Parkway on Hwy 56 then takes a tire-burning plunge into the town of Vesuvius. From here, the TransAmerica Trail pushes through Lexington before continuing to Roanoke and eventually the west coast. For bike rental contact Shenandoah Rides & Rentals at 540-458-1337. Motorcycle riders, are you ready to rock-and-roll? The 90-mile Sport Tour Loop charges from Buena Vista into the Blue Ridge, following a wickedly curvy route that swings past the trailhead to the ever-dropping Crabtree Falls. To return to Buena Vista, choose your own adventure: follow Route 11 into historic Lexington, glide past natural beauty on the Blue Ridge Parkway or ride a lonely road beside the South River, a fly fisher's delight. 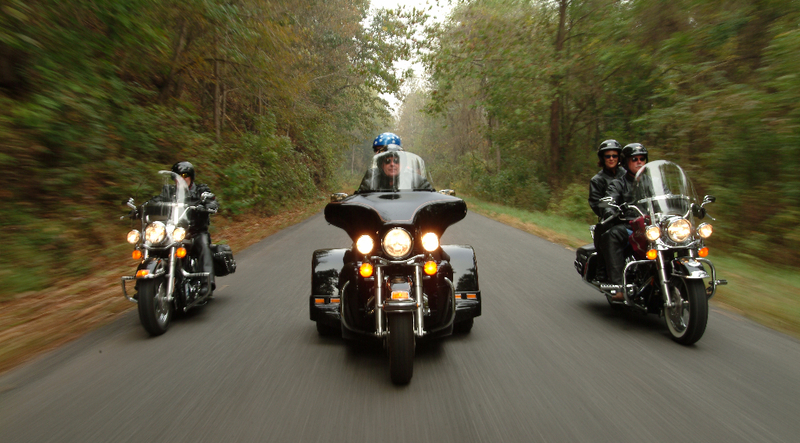 Motorcycle rides near Lexington and Buena Vista are mapped in the Roanoke Valley & Rockbridge Rides brochure. Sixty-five miles of horseback riding trails lure equestrians to Rockbridge County. Three of them – Balcony Falls, Sulphur Springs, and Piney Ridge – unfurl through the Jefferson and George Washington National Forests near Natural Bridge. The Balcony Falls Trail climbs to a lofty view of Glasgow and the James River. For information about equestrian trails, visit the George Washington & Jefferson National Forests website. For guided trail rides and lessons contact Tish Vest Horseback Riding at 540-570-3718.